Giveaway: Bona Hardwood Floor Mop!!! 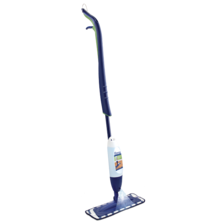 A premium spray mop combo, includes Microfiber Mop and Bona Hardwood Refill Cartridge all in one! Quick, easy to use, and leaves no dulling residue. I love my Bona mop. I have hardwood floors through out my home and was excited to review the Bona Hardwood Floor mop. I took it right out of the box and used it all over my house. My cats were scared of the mop at first and I found it funny. The mop cleaned my floors great and I now use it when ever I want my floors cleaned. Now for the giveaway: One lucky person will win a Bona Hardwood Floor mop. This is open to US & Canada and ends 9/7/12 @ 11:59 pm est. To enter, simply do the tasks on the Rafflecopter widget below and you're set to have a chance to win! The nearest retailer to me is Walmart.